Who wants a unicorn? I do! I do! I want I want I want. And I want this book on my shelf. You Don't Want a Unicorn! 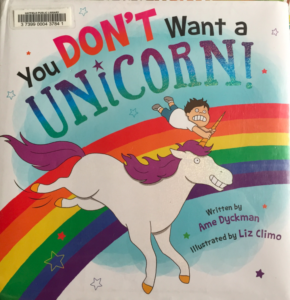 By Ame Dyckman, illustrated by Liz Climo tries to change my mind, buuut, I still want one:) In this book, the sequence of horrible happenings as a result of a wish for a unicorn is, I think pretty realistic, and SO funny. I didn't know unicorns poop cupcakes. I didn't know unicorns want more unicorn friends! Awesome! Gimme a legwarmer-rocking-orange-fro unicorn! 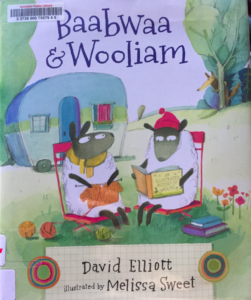 Baabwaa & Wooliam by David Elliott, illustrated by Melissa Sweet, is SUPER funny and SUPER cute. Being regular everyday sheep, that do regular everyday sheepy things, Baabwaa & Wooliam decide they need an adventure. Soon they find that means a lot of walking, perhaps eating a snack, and maybe being approached by another sheep. Aaaugh! That's not a sheep! You have to see what happens next! 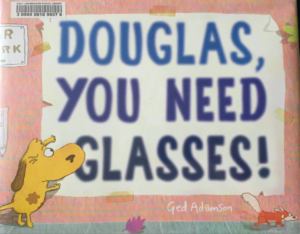 Douglas, You Need Glasses! by Ged Adamson is SO colorful. SO funny! SO cute. Douglas has always had trouble seeing. But it gets bad. Really bad. He ends up causing a bit of trouble by mistaken identity. (Hilarious trouble) So, Nancy takes him to see the eye doctor. He finds some rockin’ glasses, and everything becomes clear. 🙂 Love this energetic little guy. You fall in love with Douglas right away. Never Insult a Killer Zucchini! Never Insult a Killer Zucchini! 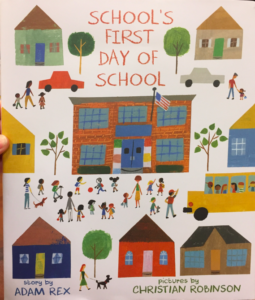 By Elana Azose & Brandon Amancio, illustrated by David Clark, is THE BEST! Best, best, best! It is an abecedarian (story told in the order of the alphabet) of a science fair. 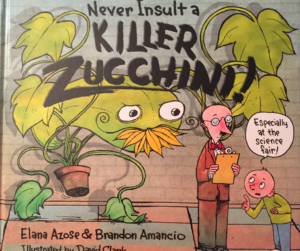 Killer Zucchini, at first, really-really likes the science teacher because he says zucchini is his favorite, but that is before Killer Zucchini realizes that is because the teacher finds zucchini delicious! To eat! Oh no! Killer Zucchini tries so hard to grab the teacher at every turn. 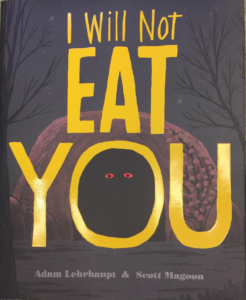 I Will Not Eat You by Adam Lehrhaupt and Scott Magoon gave me a fun surprise! I thought for sure those glowy red eyes would stay in that dark cave:) Then, those eyes get pretty sure they're gonna eat that obnoxious kid. Yup, pretty sure. What the beastly eyes are attached to comes out and gives chase! And... and... I won't blow it, but it's awesome! The illustrations being wild and raw make it even more perfect. 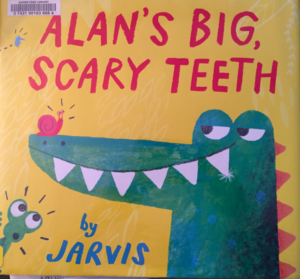 Alan’s Big, Scary Teeth by Jarvis made me laugh out loud! Of course Alan has his morning routine. Before he can go out and be scary he has to brush his teeth and practice in the mirror. After a big day of scaring the jungle-folk he goes to bed. And so do his big, scary, razor-sharp teeth! No one knows about his false teeth. He says “Thweet dreams, my theary thnappers.” As he tucks them in! SO funny! Then, then! I can’t even tell you. It gets even funnier! Super read. 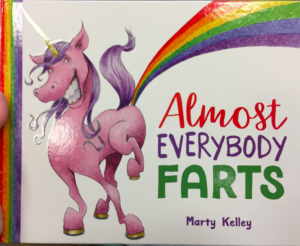 Almost Everybody Farts by Marty Kelley is HILARIOUS! I was laughing out loud. It's just great. The illustrations are beyond funny. Yes, even rabbits fart, I know, I have a rabbit. Oh man, this was a much needed laugh. Thanks so much Marty Kelley. Ame Dyckman did it again! 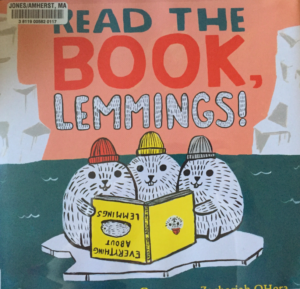 Read the Book, Lemmings! is HILARIOUS. I can hear their cute little lemming voices as they say “ME TOO!” & “DITTO!” and then they jump! Thank goodness the fox is patient enough to keep pulling the lemmings out of the water or they’d drown. Hahaha! Fox is a hero:) Those lemmings man... I think the ADORABLE illustrations by Zachariah OHora are a perfect paring. So cute, and round, and bouncy, and eager looking. Too cute. (If you look close, you’ll see the ship they are on is a whale!) This book is great. Just GREAT. 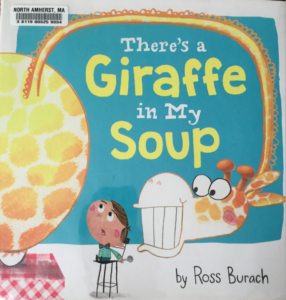 There's a Giraffe in My Soup by Ross Burach is SO amazingly funny. First, how can you go wrong when it begins with a little guy on a Big Wheel? Classic. Then, when the soup keeps arriving with zoo animals in it, I am laughing out loud. Hahahaha! The text is just as animated at the characters too. Loved it! 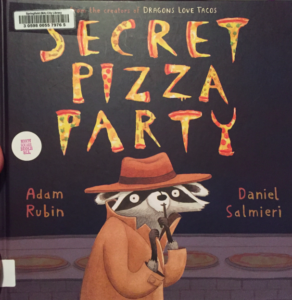 From the Dragons Love Tacos team... Secret Pizza Party by Adam Rubin, Illustrated by Daniel Salmieri is REALLY funny! This racoon REALLY REALLY wants pizza. He wears a disguise, he tries to get the pizza and he just gets a broom shoved at him. The narrator helps the racoon devise a plan to get the pizza. SECRET Pizza. Adam Rex doesn't disappoint! 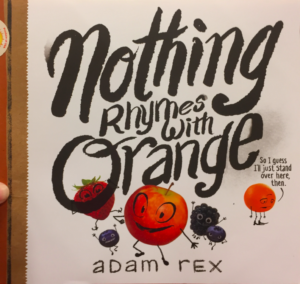 Nothing Rhymes with Orange. At first I didn't think I'd like it to be honest. Having Orange feel so horrible would make me feel horrible right? Well... the narrator becomes so ridiculous that I was agreeing with Orange! I thought it went off the rails with Friedrich Nietzsche but then pear gets lost at night. Just silly nonsense the whole way through.